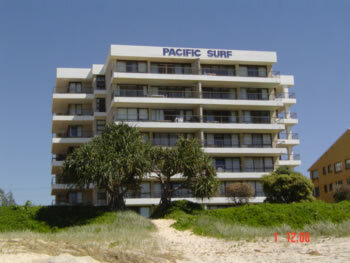 Pacific Surf Apartments offer spacious 2 bedroom 2 bathroom beachfront accommodation. Pacific Surf Apartments are situated right on the pristine beach at Tugun, a short stroll to Kirra beach and close to Coolangatta where there is a wide selection of entertainment including restaurants, cafes and Clubs plus great shopping. Public transport to all parts of the Gold Coast including all Gold Coast Theme Parks is at the front door. Also the facilities include, pool, wading pool. half tennis court and BBQ area set in a tropical garden location.